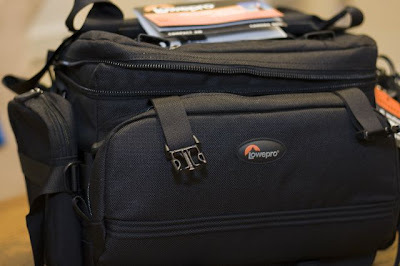 I bought a camera bag and it arrived today! I was actually doing my Walk Away the Pounds DVD when the dude arrived. I muted the TV so as not to be found out, but continued walking anyway. I thought he was never going to leave in his truck. Anywho. 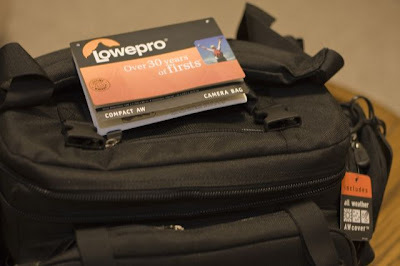 As the title says, I bought the Lowepro Compact AW (AW apparently stands for All Weather). So far I love it! 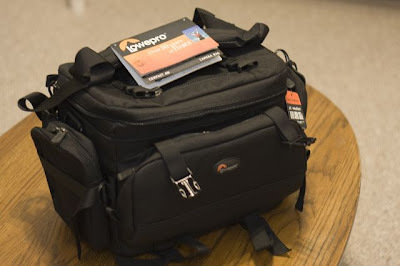 It holds 2 pro SLR's, 3-5 lenses, a flash and accessories such as batteries, CF cards, etc. It has little compartments everywhere. I don't think it's designed to be used during shooting, but rather getting the equipment to the shoot. I guess you could use it while shooting, but you can't really get to your gear quick enough, it seems. I will have to do some testing. In other news, I rented a fancy shmancy lens today from Dury's, the local photo shop. They don't have a huge selection, but they're the only place in town that seems to rent equipment. Anyway, I rented the Canon 17-35mm L series for this Sunday's shoot with The Martin family. I can't wait to get my hands on that thing. I'll post some pictures hopefully on Sunday night or Monday.